Last Monday Tom and I hosted a surprise birthday party for Tom's dad. We invited everyone from Tom's side of the family over for a BBQ dinner and cake. We ended up with 31 people in our 860 square foot condo for the evening! 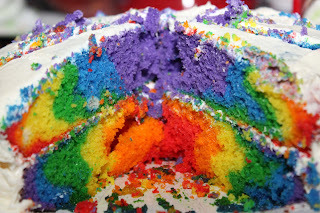 I have 2 friends who have recently made rainbow cakes and posted pictures of them on facebook. They were so bright and pretty; I really wanted to try one. In the end I made 3 for this party! 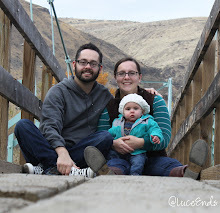 Below are pictures of the steps I used, roughly following these directions. 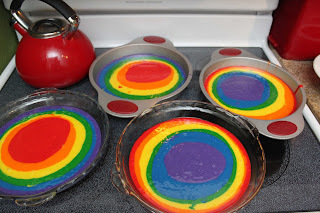 White cake mix (I followed the directions for mixing on the back of the box: eggs, oil, water), gel food coloring, at least 2 cake pans (each box makes 2 layers), lots of bowls and spoons for mixing. 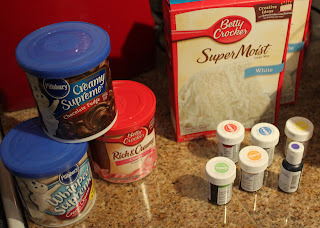 Mix the cake as directed (I think any cake recipe would work) and divide evenly into 6 small bowls. 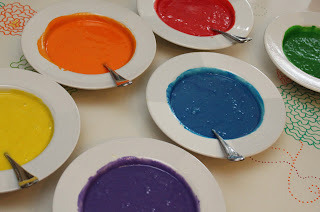 Add the gel food coloring, stirring well. 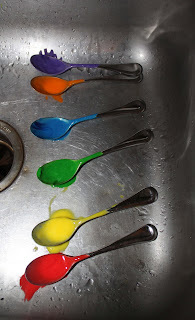 I used about a quarter to a half a teaspoon per color. I found that I needed the most red and orange coloring to make them look as strong as the other colors. Bake according to your box or recipe instructions. Let cool in the pan for a few minutes, then remove to a plate or cake stand to finish cooling. Frost it and clean up! I used container frosting because I didn't have time to make any. I think the less fluffy the frosting, the better. I used one can of fluffy cream cheese frosting, and it was so light that it didn't really want to come off the knife and stick to the cake.